Birds Hill Park Ranch - Fun for the whole family! Birds Hill Park Ranch offers scenic and relaxing riding trails and the nicest horses around! Families, children or group parties, come and enjoy the best in horseback riding. Our ranch is located in Birds Hill, Manitoba about 20 minutes east of Winnipeg. Join Birds Hill Park Ranch for a trail ride in and around the park and view our spectacular scenery and wildlife. Don't forget to bring your camera! While on a guided trail ride you may see deer, owls and various other wildlife. We have horses to suit any rider, whether beginner or experienced. Birds Hill Park Ranch offers you a ride with safety in mind. Located in the midst of beautiful Birds Hill Park, our ranch provides the perfect venue to stage group activities. 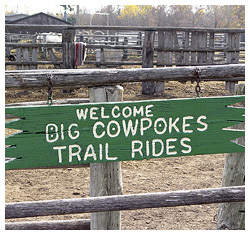 Trail rides are our specialty, and we also offer barbeques, sleigh and wagon rides. "Thanks for the warm hospitality and great food on Friday, Feb. 17 for our Media Ride!" © Birds Hill Park Ranch. All rights reserved, no part of this website may be copied or reproduced with out expressed written consent.